Imagine Dragons is a Grammy award-winning alternative rock band which formed in 2008 in Las Vegas, Nevada, United States. The band consists of Dan Reynolds (vocals), Wayne Sermon (guitar), Ben McKee (bass) and Daniel Platzman (drums). The band released four EPs - "Imagine Dragons" (2009), "Hell and Silence" (2010), "It's Time" (2011) and "Continued Silence" (2012) - before releasing their debut full length album "Night Visions" on 4 September 2012. The band's single "It's Time", which previously appeared on the "It's Time" and "Continued Silence" EPs in addition to appearing on "Night Visions", is the group's biggest hit, reaching #33 on the Billboard Hot 100. In a dark kitchen in the middle of a sweaty night in Las Vegas, all 6’4” of Dan Reynolds is hunched over a laptop, slapping beats on the table and crooning lyrics into a tiny microphone. Before long, he and the other three members of indie rock band Imagine Dragons would be playing “It’s Time,” that same laptop-demo-turned-supersized-anthem, from the roof of a parking garage to a wave of thousands of screaming fans. This song title to the single from their 2012 debut KidInaKorner/Interscope release “Continued Silence EP” is an all too apt descriptor of the band’s hard-earned success—but it’s also emblematic of the deep-seated anxiety Reynolds and the rest of the band experienced leaving behind any realistic expectation of a normal job to do the thing they love most. A third-generation Las Vegas native, Reynolds is no stranger to the adage “the house always wins,” choosing to pave his musical career with a near obsessive work ethic and hundreds of unused demos rather than roll the dice with the first songs that sprung from his mouth. It’s no surprise, then, that he was drawn to guitarist Wayne Sermon, another founding member of Imagine Dragons. Having practically grown up in a recording studio and graduated Berklee College of Music, Wayne had been practicing his guitar through meals and other socially inappropriate situations as long as he could remember; he challenged Dan in a way that was both uncomfortable and exactly what they both needed. When they began writing songs together and recognized something special was happening, Wayne called up his Berklee friend Ben McKee, who promptly dropped out of school with only a few credits left, moving across the country to play bass for the band. This sort of reckless/genius behavior is typical for Ben, who has an uncanny penchant for spicy food and a suitcase full of unbelievable road stories. More recently, the band was joined by drummer Daniel Platzman, another Bostonian schoolmate who seems way too nice to be playing rock and roll until you actually see him in action. Several tours and three self-released EPs later, Imagine Dragons had made a serious name for itself, particularly in the west coast circuit. Although their songs vary from nearly whimsical and light to brooding and powerful, listeners are drawn to the inherent honesty in the music. The only rule of thumb for the band, it seems, is to write from a true place; the result is songs that literally run the spectrum of human emotion. Attend a concert, and it becomes clear that the live performance of deeply personal songs has a real effect on people. And the band itself is not immune, as demonstrated when Dan literally passed out into the drum set during a finale song, sending cymbals and drum stands crashing while the rest of the band played on until the close. Great songwriting is bound to be noticed eventually. As proof that the harder you work, the luckier you get, one of those people who noticed was Grammy winning producer Alex da Kid (Eminem, Rihanna). Alex and Dan began collaborating on projects, and soon the band had developed a relationship with Alex and his team. The alchemy resulting from Alex’s hip hop sensibilities and Imagine Dragons’ anthemic rock is nothing short of explosive. The byproduct of this creative collision is “Continued Silence,” a six song in-your-face sonic grenade that breaks musical boundaries and yet is strangely relatable by its improbably diverse audience. 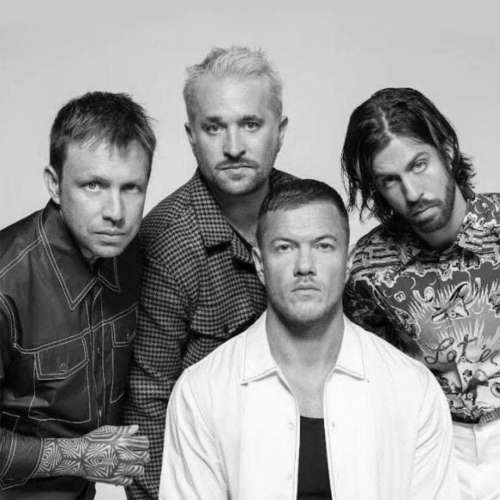 Despite it all, on any given day when they aren’t on the road playing shows, you can still find Imagine Dragons huddled away in a rehearsal room somewhere, banging out song after song in search of the next perfect track. Like most things in Vegas, the band is angled at going big or going bust. For the sake of those who love great music, we hope it’s the former.